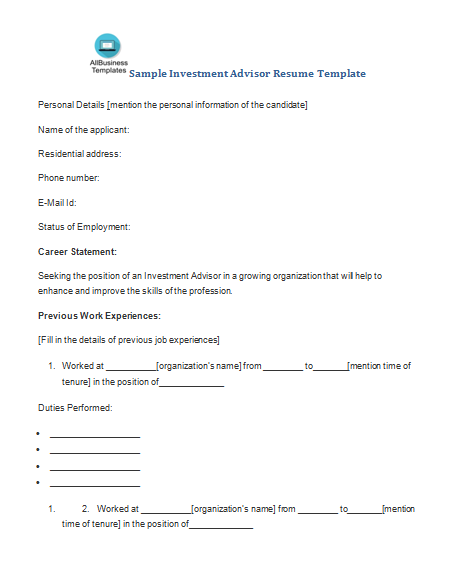 How to write a Sample Investment Advisor Resume template? An easy way to start is to download this Sample Investment Advisor Resume template now! A well-designed banking resume sample can really go a long way in determining the chances of you landing your favorite job in a bank. The biggest plus with a resume template is that you can download and customize with relevant information and details to represent your candidature at an upcoming interview for a job-profile in the banking sector. Lucky for you, we have already pulled up the best samples for you to make a choice from! This is a compact free download investment advisor resume template which offers points on how to write a standard career statement followed by the mention of previous work history & duties covered. Now we provide this standardized Sample Investment Advisor Resume template with text and formatting to help you finish your document faster. If time or quality is of the essence, this ready-made template can help you to save time and to focus on what really matters! Our Templates have helped many people to reach the next level of their success.Download thisSample Investment Advisor Resume template now for your own benefit! This template will perfectly suit your needs! And after downloading you can craft and customize every detail of its appearance very quickly.